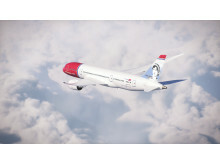 To reflect Norwegian’s rapid growth in the UK, where it flies 5 million UK passengers each year to more than 40 global destinations, the airline is planning a series of British tail fin heroes. Jane Austen will become Norwegian’s sixth British tail fin hero, following the announcement of rock legend Freddie Mercury, footballer Bobby Moore, children’s authorRoald Dahl, pioneering pilot Amy Johnson and aviation maverick Sir Freddie Laker. The portrait of Jane Austen, which will be used to adorn the tail of a Norwegian aircraft, has been taken from a late nineteenth-century engraving, commissioned by Jane Austen’s nephew. The engraving is based upon National Portrait Gallery London’s pencil and watercolour sketch of Jane Austen, by her sister and closest confidante Cassandra Austen in 1810. The Jane Austen tail fin will take to the skies next summer when it will adorn a Norwegian Boeing 787 Dreamliner aircraft.